CPL has been shortlisted for the Best Use of Innovation accolade at this year’s International Content Marketing Awards organised by the Content Marketing Association (CMA). CPL’s in-house design and digital development team created and built a new microsite for Club Godolphin. This is a members’ area dedicated to the global horseracing team’s fan club and includes the Fantasy Stable League and the bespoke game engine that drives it. Members play the game by creating their own fantasy stable of 10 actual Godolphin horses and then experience the ups and downs of racing as their horses compete in real races around the world. Points are awarded based on real-world performances and can lead to monthly and overall prizes. This innovative game is the first international fantasy horseracing competition to be owned and run by a leading racing stable. 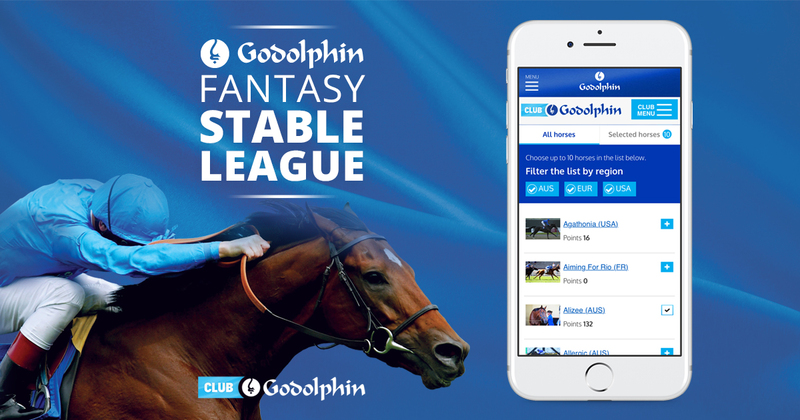 The Fantasy Stable League collates member details during the free sign-up procedure and gives the marketing team at Godolphin a rich source of user data. This covers everything from a member’s age, gender and location to the types of competition and offers that attract the most engagement, as well as the usual metrics of devices and browsers used, and time of day. CPL’s team developed a service that encourages the exploration of the main Godolphin site by providing cross-links as well as giving the client the opportunity to publish exclusive content and member-only promotions. For this year’s awards, the CMA received more than 400 entries from 135 agencies in 23 countries, including the USA, Sweden and Australia. Nominations spanned work for more than 260 brands and businesses – including British Airways, John Lewis and Samsung – and CPL is shortlisted in a category alongside agencies representing Microsoft, Cadbury and Adidas. CPL is, hands down, one of the best digital agencies we have ever worked with. Since January 2017 when round one of the Fantasy League was launched, Club Godolphin membership has grown from zero to more than 26,000. CPL has worked with Godolphin’s breeding operation, Darley, since 2008, creating and delivering a range of global marketing and content services, including advert design, outdoor marketing, digital design and media buying. The winners will be announced on Tuesday 28 November, during a ceremony at the Camden Roundhouse, London.